Half a million German Prisoners were scattered through the US in 511 POW Camps. With no precedents upon which to form policy, these foreign prisoners were placed into CCC camps, high school gyms, fairgrounds and even race tracks to wait out the war. This is the only book available that tells the full story of how the US government, between 1942 and 1945, detained nearly half a million Nazi prisoners of war in 511 camps across the country. 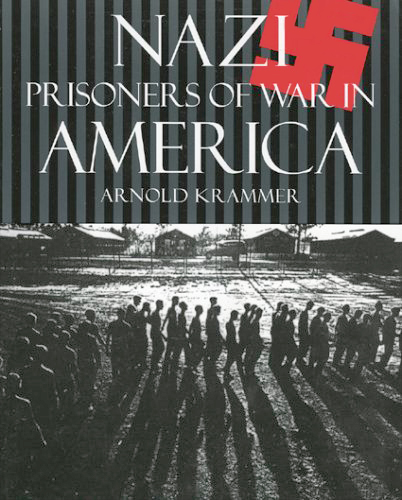 With a new introduction and illustrated with more than 70 rare photos, author Arnold Krammer describes how, with no precedents upon which to form policy, America's handling of these foreign prisoners led to the hasty conversation of CCC camps, high school gyms, local fairgrounds, and race tracks to serve as holding areas. The Seattle Times calls Nazi Prisoners of War in America "the definitive history of one of the least known segments of America's involvement in World War II. Fascinating. A notable addition to the history of that war." 31 Mar 41 - British Army Dental Corps Private Coe becomes first to escape from a German POW camp. 25 Jun 41 - French POW at Colditz Castle almost makes successful escape, dressed as a young woman. 02 Jul 41 - French POW at Colditz Castle successfully escapes, leaping wire fence, scaling outer brick wall. 16 Aug 41 - Two Dutch POWs escape Colditz Castle, the first successful Dutch escapees. 05 Jan 42 - Airey Neave becomes first British officer to successfully escape German POW camp (Colditz Castle). 14 Oct 43 - Massive escape of Jews and Soviet POWs from Sobibor. Only 50 of 300 successfully escape. 24 Mar 44 - The Great Escape. 76 POWs escape from Stalag Luft III, 3 will make it home, 50 will be murdered. 16 Jul 44 - New Zealand POW escapes from Japanese camp in Hong Kong, the only POW there to successfully do so. 23 Dec 44 - The Great Papago Escape. 25 Germans POWs tunnel out of a camp outside Phoenix, Arizona. 28 Jan 45 - Last of the 25 German POWs from the Great Papago Escape is recaptured in Phoenix. 10 Mar 45 - German POWs tunnel out of a camp at Bridgend, Wales. All 70 are captured within a week. 15 Apr 45 - POW camp at Colditz Castle liberated by US troops. Colditz had the most successful escapes of the war. 04 Aug 45 - German POW escapes from North Carolina camp, takes train to Chicago, remains at large until 1959. 21 Sep 45 - German Georg Gaertner escapes from a POW camp in Deming, New Mexico, blends in for 40 years. 12 Sep 85 - Escaped German POW Georg Gaertner turns himself in after 40 years of hiding in plain sight.